Standard size hot dogs will take about 10-15 minutes to heat up if on the high heat setting. It will take longer for the larger hot dogs/sausages. Plan accordingly. 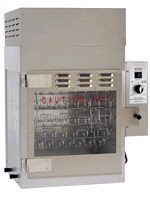 Hot dogs and sausages can be kept on the rotisserie for several hours without shriveling or loss of flavor, if the heat setting is set low enough. * Please call us with any questions about our hot dog machine rentals in Kennewick, WA and Richland, WA.